A not so rich couple decided to stay at a very exclusive hotel for a night. The manager immediately recognized them for what they are but could not throw them out, instead he decided to be clever. In the morning the couple came to settle the bill and were surprized to find they owe $3000. We've only been here one night!" the man was annoyed. "So? ", said the manager, "this is a very expensive hotel. We have golf courts, tennis courts, swimming pools, exercise rooms, bars and restaurants, all this is very expensive to keep up." "But we didn't use any of these!" explained the couple. "In that case, you owe me $2000. 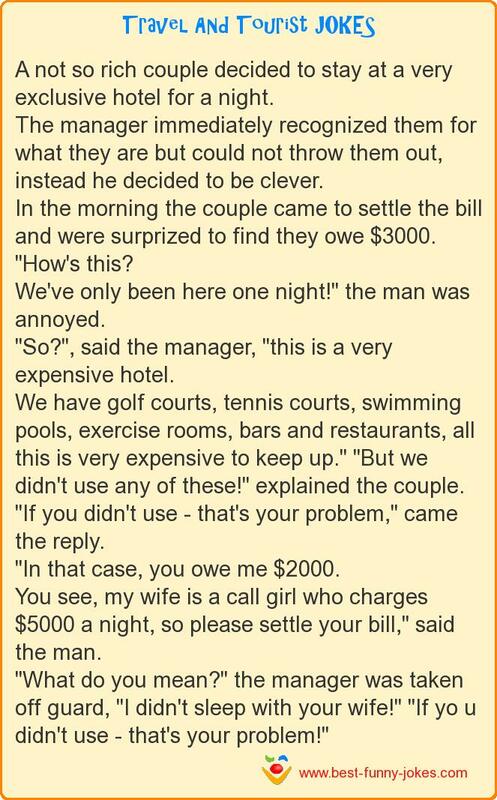 You see, my wife is a call girl who charges $5000 a night, so please settle your bill," said the man. "What do you mean?" the manager was taken off guard, "I didn't sleep with your wife!" "If yo u didn't use - that's your problem!"